Today I needed to come up with a quick new dessert and I decided to invent something new. Yesterday I had planned to make a Cuban dessert called Dulce de Naranja en Almibar (Candied Orange Rinds) but I only had two oranges and needed the dessert to cover more servings. So I decided to incorporate it into something new and different... I think. In Spanish, the word for banana is banana, but in Cuban dialect, especially in Eastern Cuba, it is called by the Native American word for banana: Guineo. So I made Banana bread with chocolate and candied orange rinds... Or "Pan de Guineo con Chocolate y Cascaras de Naranja." You need oranges with a thick rind, as that makes it easier. Then you peel the yellow, acrid outer skin... That makes a great cleaner by the way. Peel it thinly, but make sure to get rid of all of it. Then cut the orange in half and remove the insides, so all that you have left is the orange rind shell. Put them in water in the fridge overnight, and let it soak. The next morning, throw away the water, put the rinds in a pot and boil in water for 10-15 minutes and then throw away the water again and repeat this 3-4 times. The rinds will become somewhat transparent. Once they are somewhat transparent, throw the water away and let them cool off. Then press them between paper towels and remove as much water as you can. Now to make the "almibar" or syrup. Boil 4 cups of water and 4 cups of white sugar and 2 cups of brown sugar, a few lemon rind shavings and cinnamon to taste; And yeah, you gonna have to stir constantly. Once it has boiled for 5 minutes, add the oranges. Keep on a very low fire until the syrup really thickens and sticks to your fingers or the spoon... It will be about two hours. At the same time make banana bread with chocolate chips... There are a million recipes out there for banana bread... It is the substrate for the candied oranges, so feel free to add any kind of sweetened bread. Once the rinds are done, let them cool off. 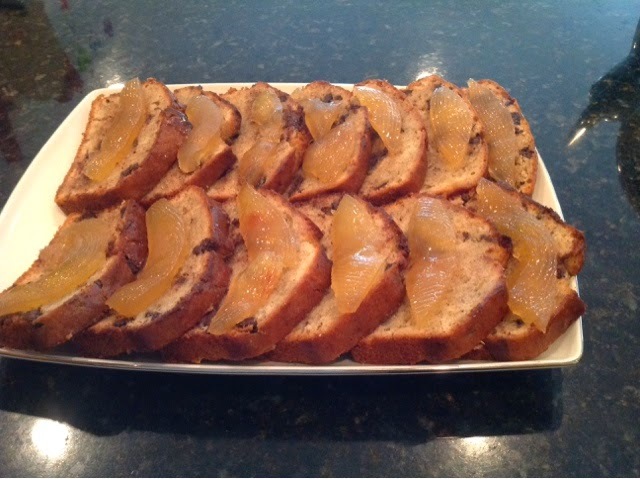 Pour some of the syrup over sliced banana bread and then dress it with slides of candied oranges. Bananas, chocolate and oranges... Yummy!